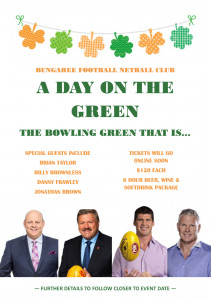 Join us on Sunday the 17th of March as we kick off our 2019 CHFNL season by hosting a Bungaree FNC ‘Day on the Green’.. the bowling green that is! Special guests on the day will include Bungaree’s own Danny Frawley, along with Brian Taylor, Billy Brownless and Jonathon Brown. Tickets for the day will cost $120 each, which includes food and a 6 hour beer, wine & soft drink package! Tickets will be available to purchase online soon! Keep your eye out for more details on the event which will be coming closer to the date!